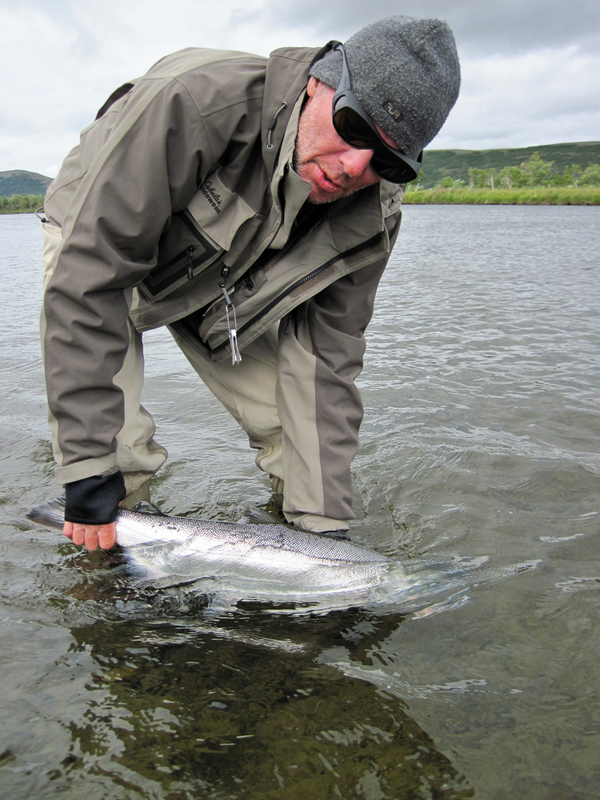 A special trip for returning anglers. Bill & Joyce Miller, Michael & Christine Curci, Bob Erickson, Richard Voss, Pete Speer, & Anaca Murphy. From the log of August 10, 2012, Goodnews River on the Togiak Wildlife Refuge: “We found Sockeye Salmon defending their redds at the outlet of the lake, Chum Salmon spawning, some Coho Salmon holding, and Pink Salmon in small schools staging in shallower water.” The fly fishing began in earnest and the group was intently focused as they switched fly patterns trying to find a pattern that worked for the Char and Rainbow but was not too attractive for the salmon who pursued out of territorial aggression. Above the anglers a pair of adult Red Tailed Hawks cruised the barren outcropped ridgeline above their nest with recently fledged offspring following close behind. A Merlin (small falcon) got “involved” with a Yellowlegs shorebird which ended in a great deal of shrieking by the Yellow legs but no permanent damage and then the Merlin rode a thermal high out of sight looking for another target. It was a fine start to a week that will go down in history as one of the finest weeks of fishing in my career as a guide. In the interval since we departed from Goodnews lake until we shoved off from camp on the morning of day 2 Richard Voss will have released the largest Arctic Grayling of his life, Mike Curci will have released a 23 inch Rainbow, Christine Curci several Char, Bob Erickson with Char and several Coho, Bill and Joyce a variety of Char, Grayling, and salmon and Anaca Murphy her first fly rod Dolly Varden Char. August 11, from the log: Mike and Christine fished and travelled with me. “Christine was in her husband’s words ‘On Fire’. 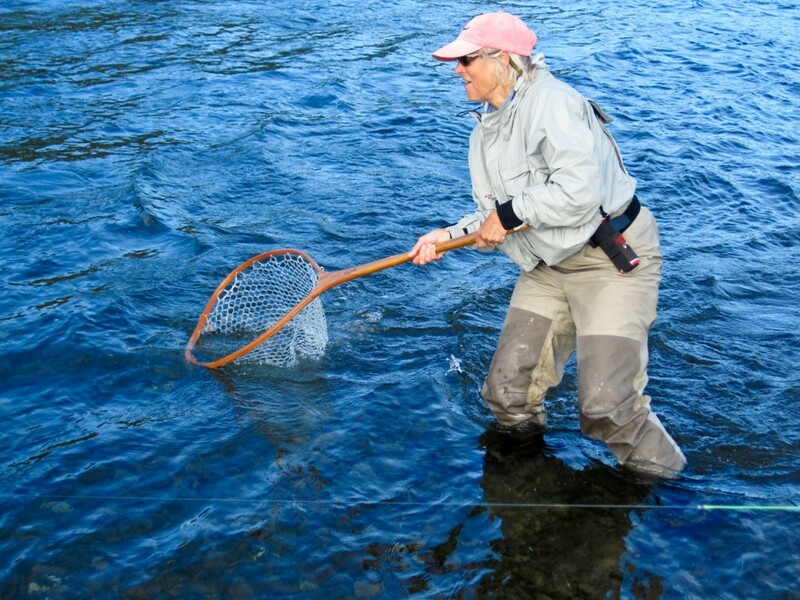 She released in excess of 16 Dolly Varden seated next to Mike and using the same fly pattern compared to Mike’s release of 6 Char.” To be fair it was no contest because Mike was too busy netting to cast much. The three of us were amazed at the productivity of the river. At a bluff overlooking a pool we paused for lunch and Bill Miller hit his stride with Char in the lower end of the pool, as did Mike Curci. Then from the lunch table we watched in amazement as Bob Erickson landed one of the bigger Sea Run Dolly Varden we’d ever seen, then later that day he over topped it with an even larger fish, which I think, was the record for the trip. A young Brown Bear returned to fish that “lunch pool” run and we thanked him for letting us borrow the bar for our lunch and pushed off down river. At another stop Pete Speer lost a couple notable Coho to dull hooks which could not be set properly, a condition he remedied, and would show us all later that day when we really needed a Char for dinner how to properly hook up. We passed enroute to camp through the long canyon stretch where the fishery is entirely a Grayling and immature Char fishery and there is no salmon spawning. Char, Basmati rice with slivered almonds, salad & Pinot Gris completed a perfect day. 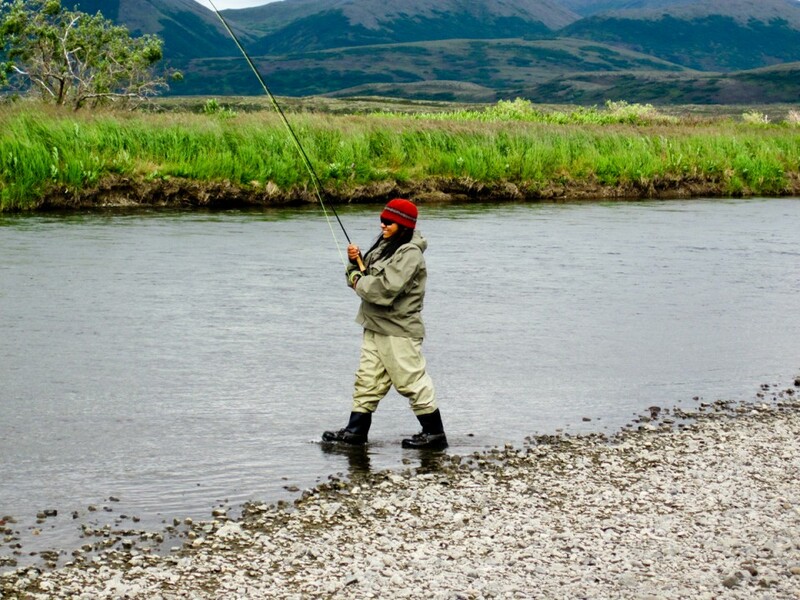 Headwater reaches of the Goodnews and other great Bristol Bay salmon spawning rivers are incredibly scenic and in the month of August produce some very good fly-fishing. One wants to linger in the beauty and one perhaps should but the headwaters are nowhere near as productive as the middle and lower reaches of the rivers. 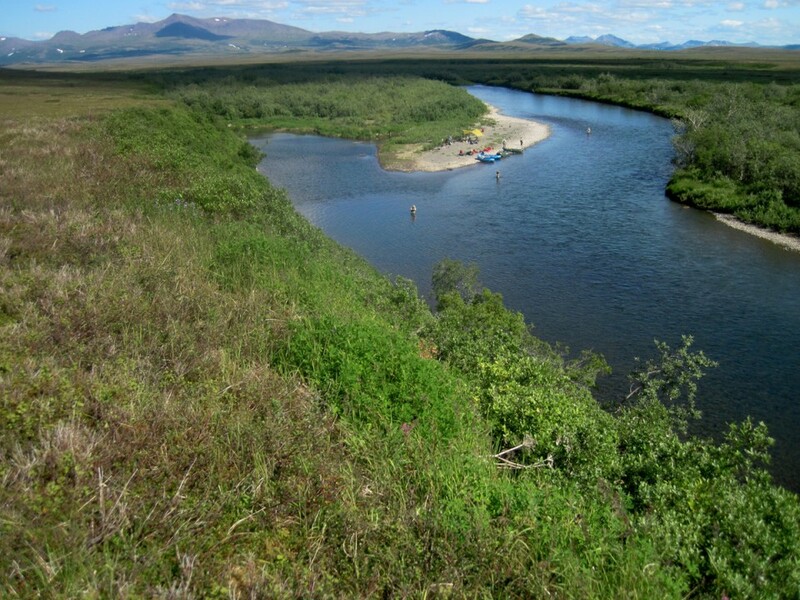 The headwaters are in glacially carved landforms where vast Pleistocene moraines of gravel alternate with hard rock cliffs, with small canyons, and even smaller zones where the river meanders away from bedrock and the gravel sorts out to sizes that salmon can utilize. 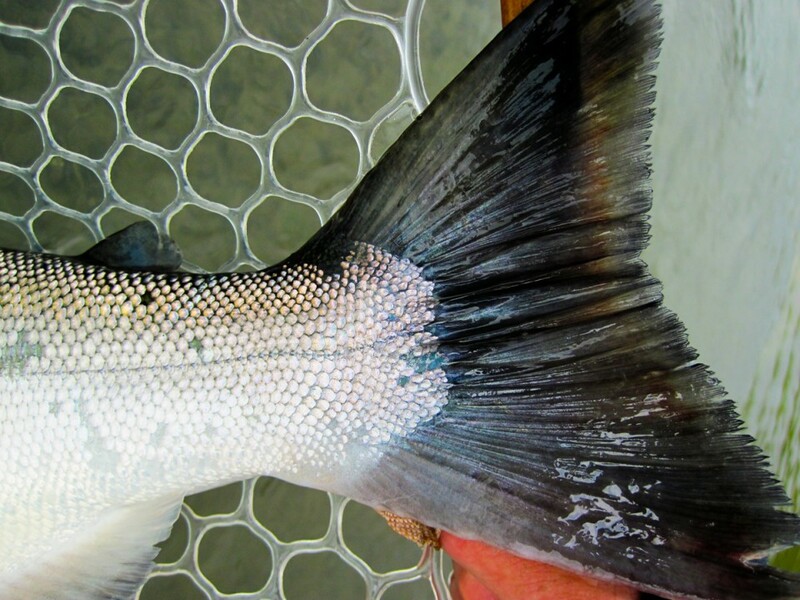 Tactically this means one fly fishes the lake outlet where moraine gravels provide salmon spawning and where Lake Trout, arctic Char, Grayling, and Rainbow attend the spawn. 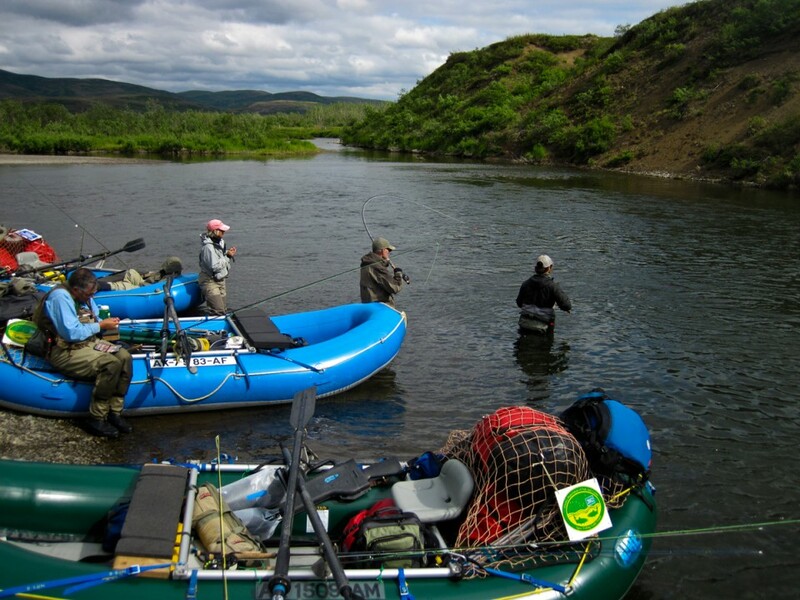 Then one rafts with restraining the casting through the stretches where hard rock bluffs “calve” angular boulders into the riverbed and there are relatively few game fish. One saves the casting for the river meanders with gravel, not large cobble or boulders, and for spawning substrate. It’s hard to be disciplined and manage one’s time for the world-class fishing! From the log of August 12, 2012. “80 degrees in the shade so we set up a sunshade and chairs at camp in the afternoon and put a few beers in the river to cool.” The river by now had finished sorting out the angular cobble from the canyon and settled into a pattern of meanders interrupted occasionally by rocky bluffs with deep pools, which hold Coho Salmon. Pete Speer and I climbed a thinly vegetated bluff using willows as handholds to get above the flood plain and see the country. The blueberries were ripening and we grazed. The angle of the sun allowed us to look down into the camp pool and watch individual Coho as they reacted to fly presentations. 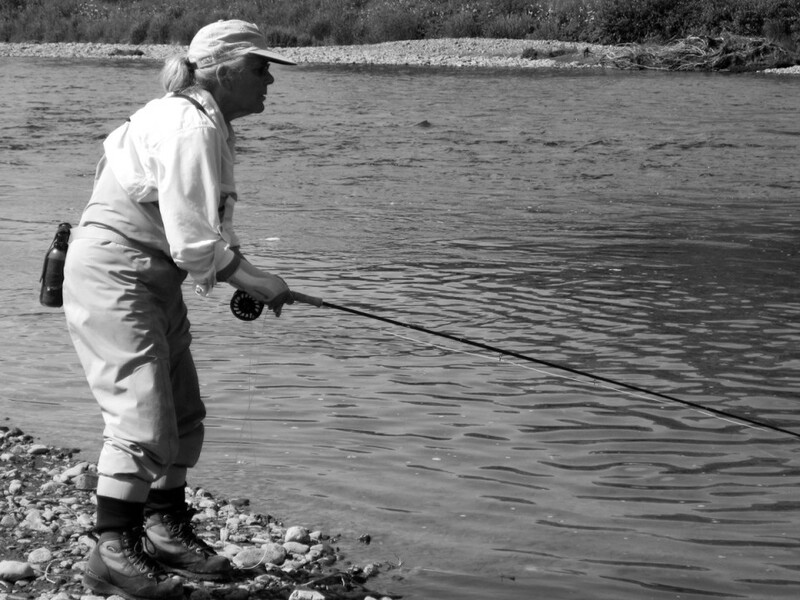 Richard Voss, casting a new RiverWatch bamboo rod made by Bob Clay in B.C. for just this type of fishing took two fine Coho and then rotated out of the pool and all the anglers took fish. Afterwards Anaca, and Olly, and I created individual pizzas and a fresh salad for dinner, which went fine with the beer. From the log of August 13, 2012: A “Forced march though Char! Unbelievable Char fishing”. Immediately out of camp the Dolly Varden fishing was strong and it got stronger by the hour until we reached a point in time where to make any forward progress by raft toward a lunch stop or camp later, we had to stow the rods, stop casting and just watch as shoals of char parted to let us pass through. 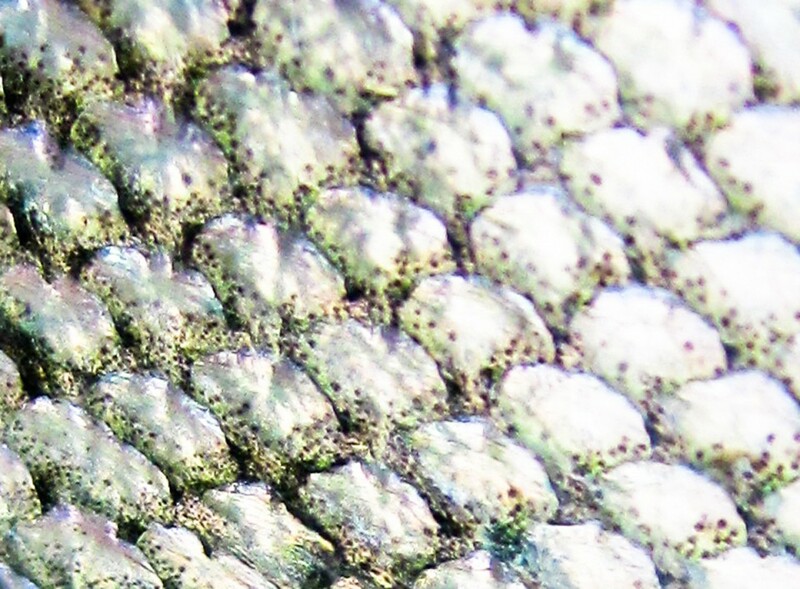 In terms of numbers of fish hooked and released the numeric figures became meaningless at some point. It was quantitatively and qualitatively one of the most amazing days of Char fishing ever. Pete and Christine sight fished to Coho at a small flood channel where you wouldn’t imagine fish would hold, yet they did. It was highly entertaining to watch their focus as they cast and played the fish. I am fairly confident that they will never forget their individual successes that afternoon nor will we who witnessed the victory dances and whooping & hollering. 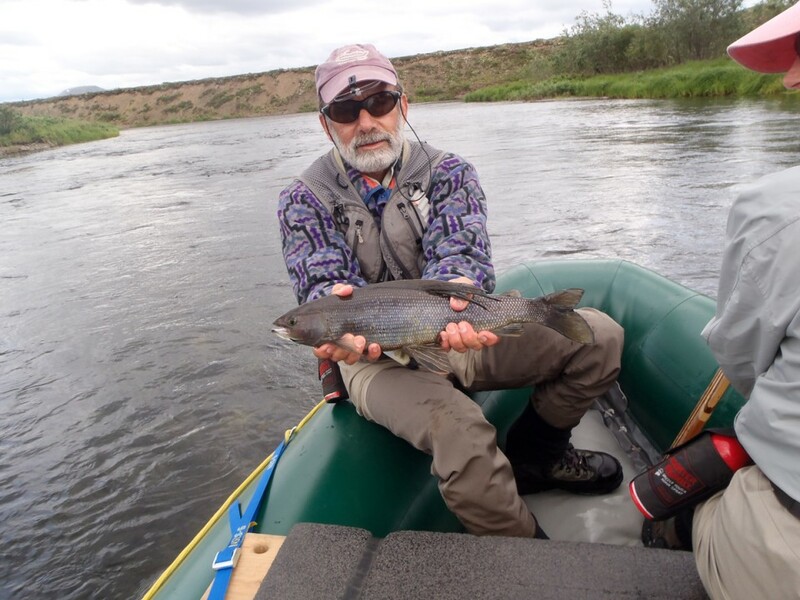 Meanwhile Richard & Mike quietly went about their business downstream hooking Silvers, soon joined by Anaca with guide Jim Bean. Anaca took her first salmon on a fly and her father cried. Perhaps that is too much information. Olly and I looked for wildlife tracks while the others fished and found very fresh wolf tracks of a single wolf, which swam across the river in the morning before we arrived. We were participating in the Alaskan salmon cycle somewhat like a brown bear whose head is down gazing at salmon, which doesn’t see the upcoming raft. 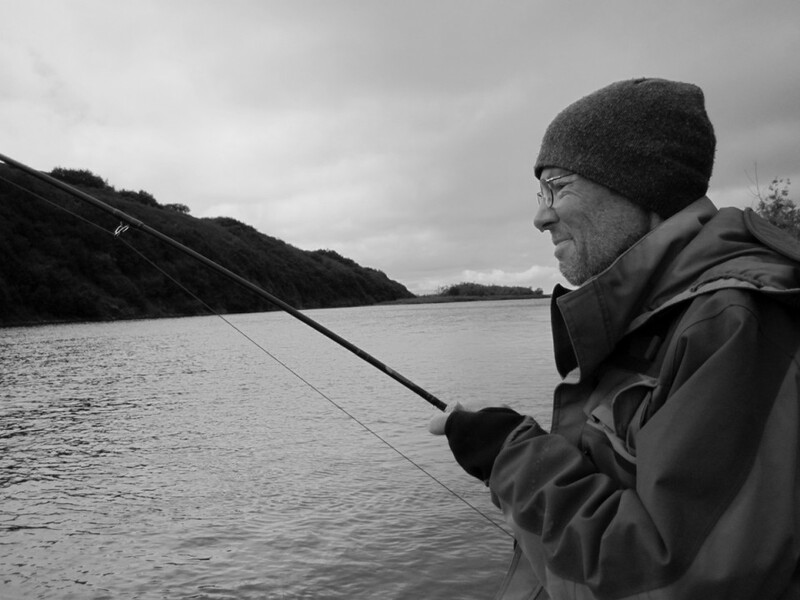 We cast and then we watched the fly line, we mended and re cast in an anglers narrow field of view. But as time went on, days passed and our shoulders got tired from casting or our cravings for the tug of a fish diminished we looked around us more at the wilderness environment. 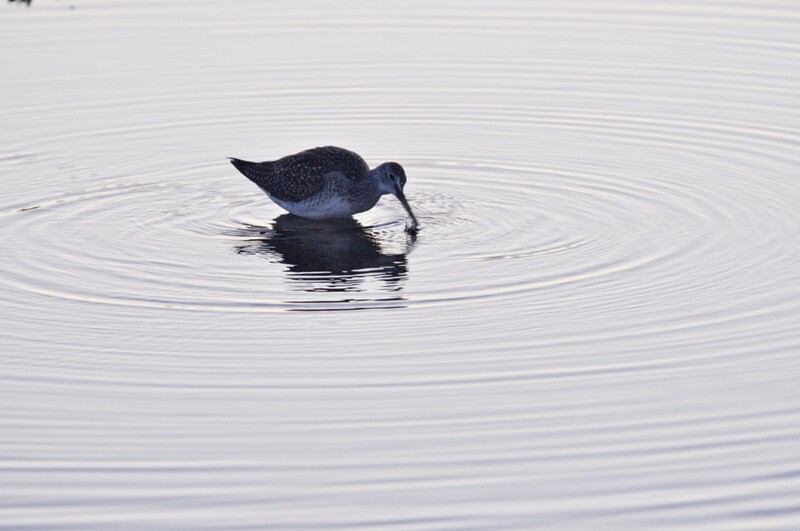 We enlisted Bill Miller, who is a world-travelled birder to help identify some Black Turnstones, for example. Mile by mile we were more aware of the big picture, the Togiak Refuge Wilderness and the Goodnews watershed that we travelled through. 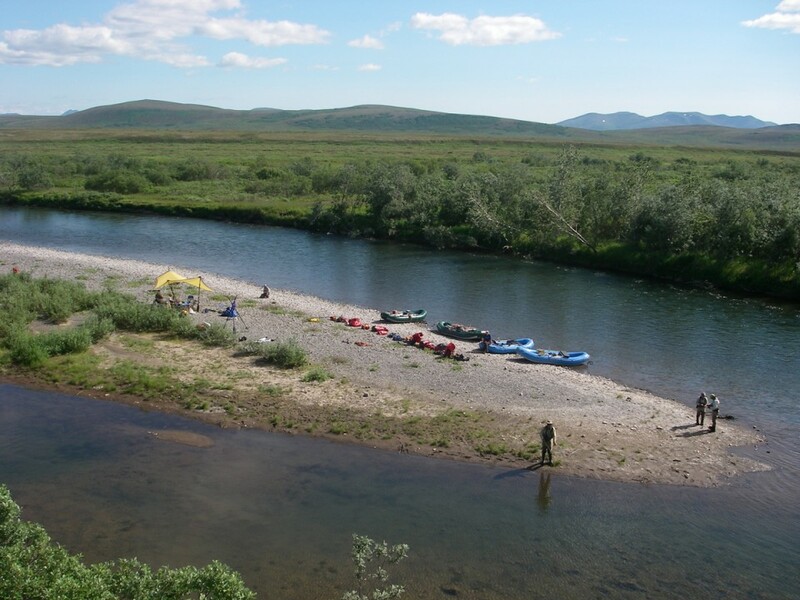 On August 14 at our camp on a long curving gravel bar on a back channel among hundreds of spawning Chum and Sockeye I noted in the log that: “We finally passed out of the massive Char population of the middle river and the fishery began changing to a classic Bristol Bay lower river salmon fishery. Many thousands of Char seen today”. The minor slough we’d camp on that night is affectionately known as “Best day of my life slough.” On a spawning channel with hundreds of pairs of chum in the late stages of spawn, the first task on arrival at camp is to remove dozens of dead Chum carcasses from the camp area and especially from upwind. 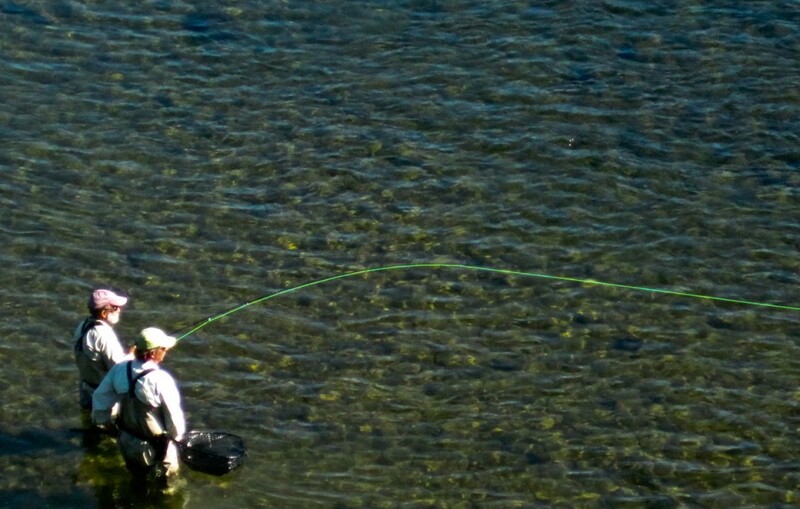 The technique, which Pete Speer knows so well from past trips during the spawn, is to use the long raft oars as a scoop shovel and then to fling the carcasses into the main current. Pretty soon the beach was clean and the air quality improving! The fishing in that back channel was mainly for Char, but some nice rainbows were taken also. Because it is a camp adjacent to spawning salmon we take extra care setting tents and kitchen well away from the screen of willow vegetation so that we can observe bears from a distance and they can observe us too. 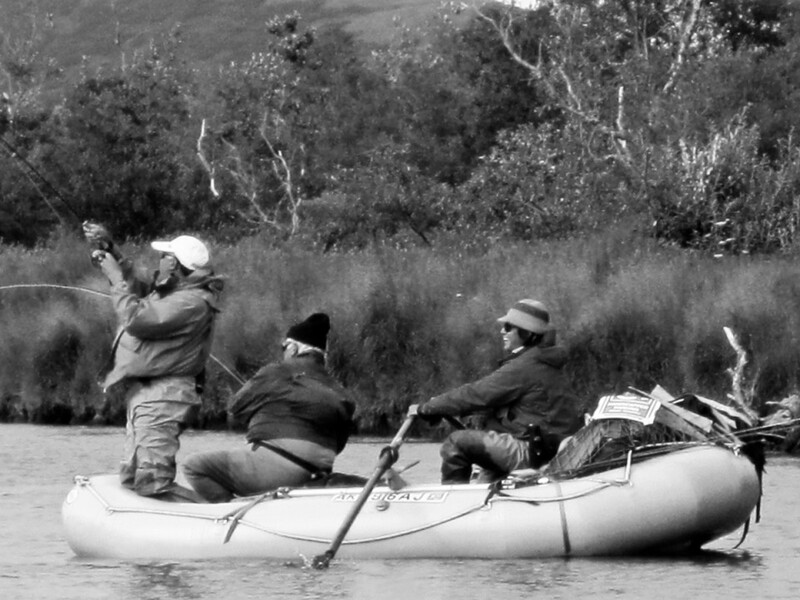 Again I’m reminded that when we travel the Goodnews and fish the areas of concentrated salmon that we are only respectfully “borrowing the river” for a bit and then we depart leaving it to the Brown Bears again. August 15, 2012. “Riverside Lupine, the same lovely purple wildflower that many of us have at home, has finished blooming and the seed pods are ripening. The shore side willow shrubs are not yet turning golden. 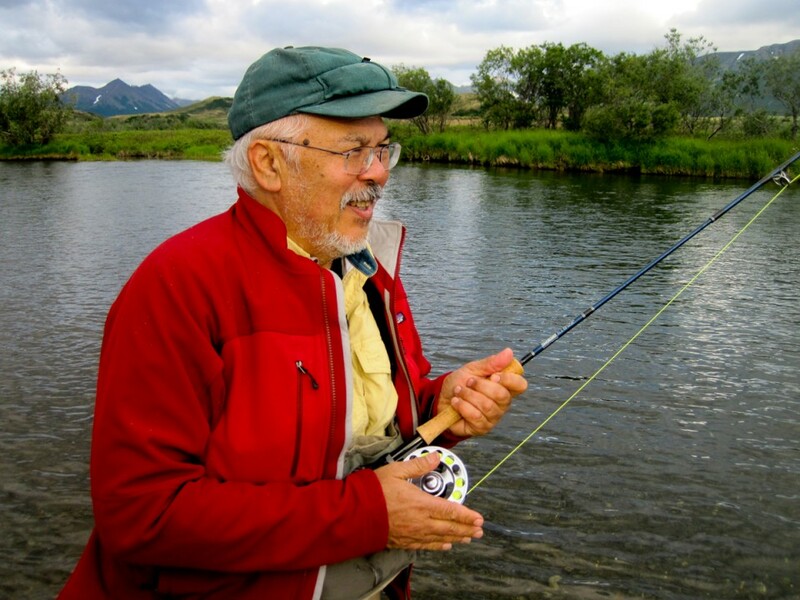 Bill Miller caught the biggest Rainbow Trout of his life. Michael and Christine fished a side slough full of Coho together and Michael released 5, Christine somewhat fewer. 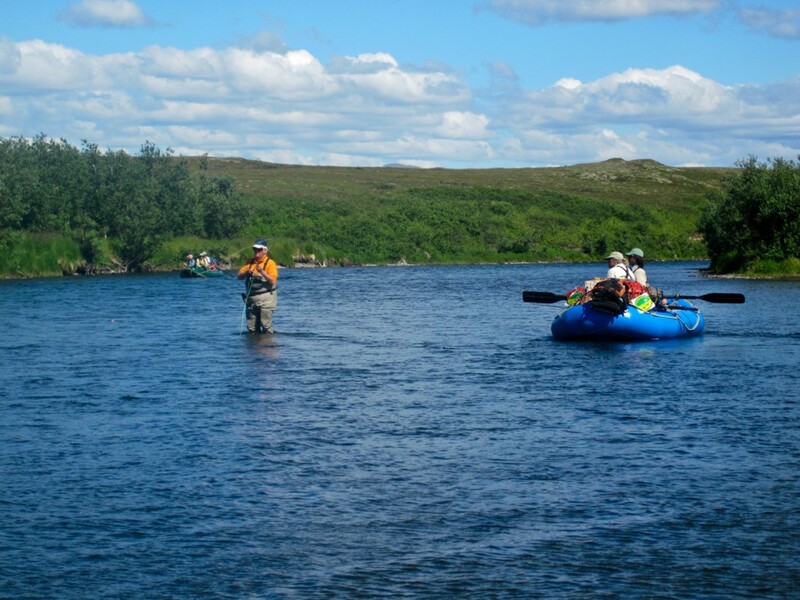 A spectacular way for the couple to share their passion for fly-fishing and the outdoors. Many of us walked up the slough to join them. Families of Sand Hill Cranes traded about the valley as we fished and Bill Miller identified the raptors patrolling the updrafts over a bluff as dark phase Rough Legged Hawks. Red Throated loons and Tundra Swans traded across our horizon. 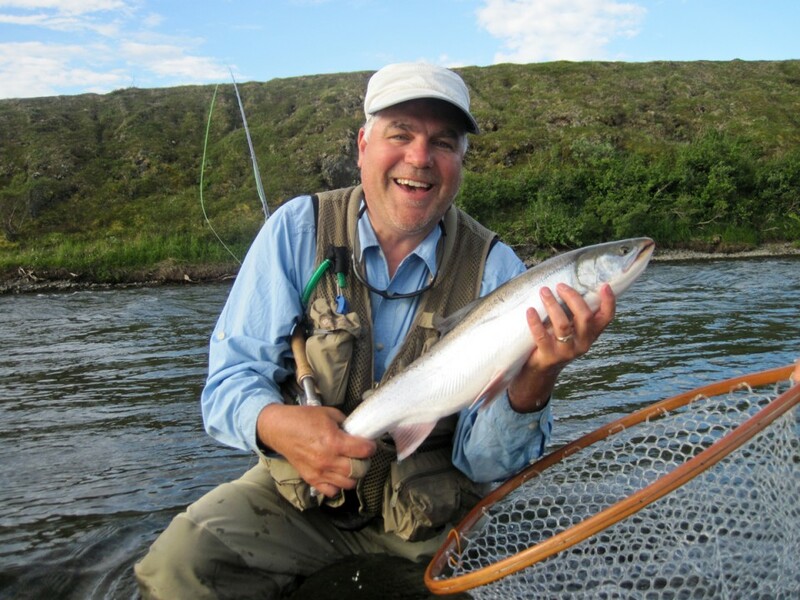 From the log of our last full day on the river, August 16, 2012: “Joyce took an Arctic Char while casting for Coho” about 60 miles below the headwaters habitat normally preferred by Arctic Char. 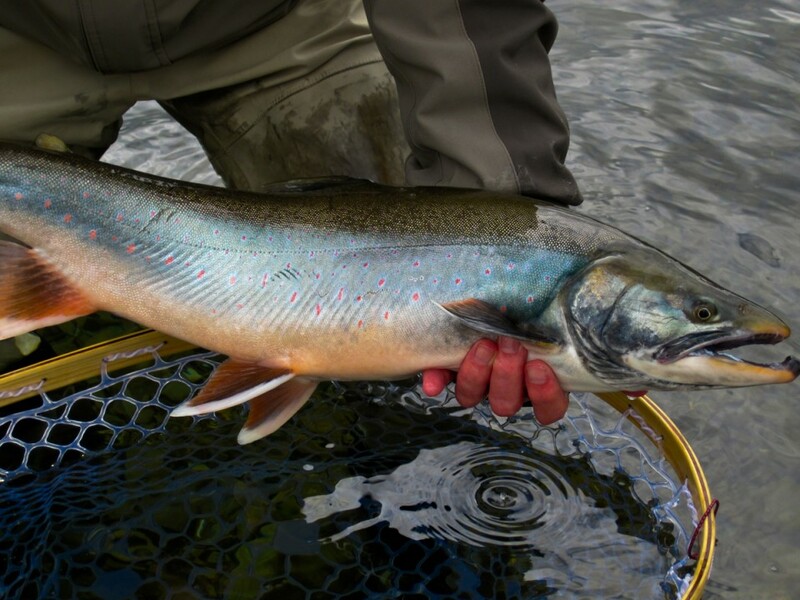 For reasons not entirely clear Arctic Char and Lake trout don’t make too much use of the main stem Goodnews but spend their lives in the Lake headwaters and the creeks up above the lake which Sockeye spawn in. 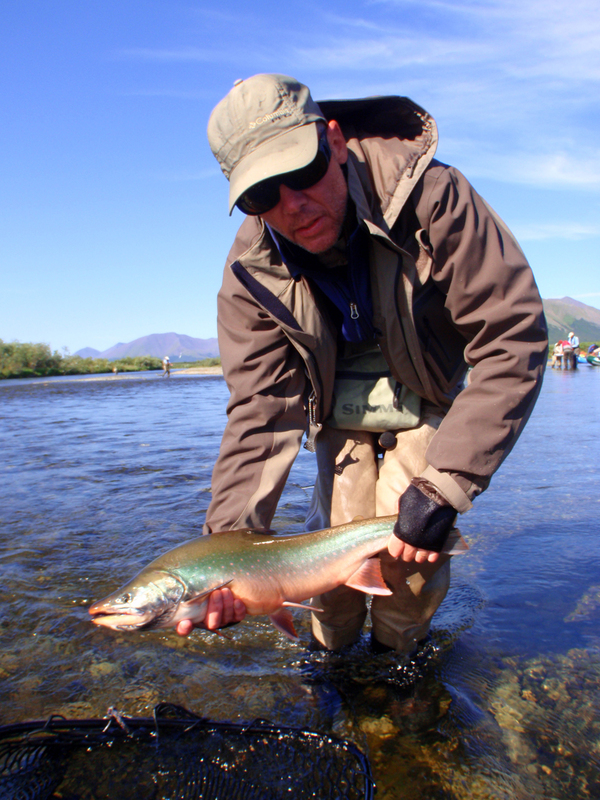 Here, the Arctic Char in Joyce’s hand was the exception. Pete Speer caught a Lake Trout almost every day this week, again the exception. 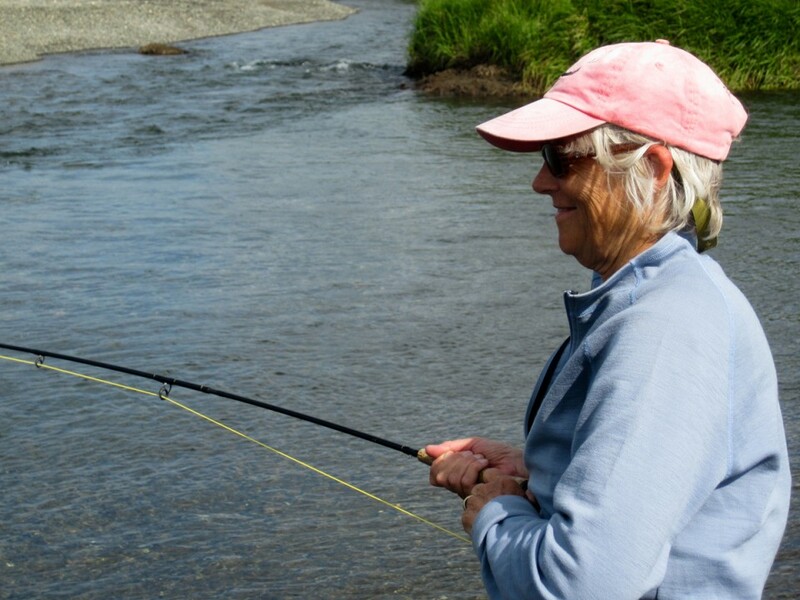 After Joyce took the Arctic Char we began one of the most productive Coho fly fishing sessions of the year. For several hours we sight cast to Silvers below a long black cliff. As time passed Bob Erickson asked to stop and rest his arm, Pete Speer rested his a bit too. Some of us just enjoyed watching the pageant as boats rotated past, rowing back upriver for another turn casting to the fish like a Coho carousel. 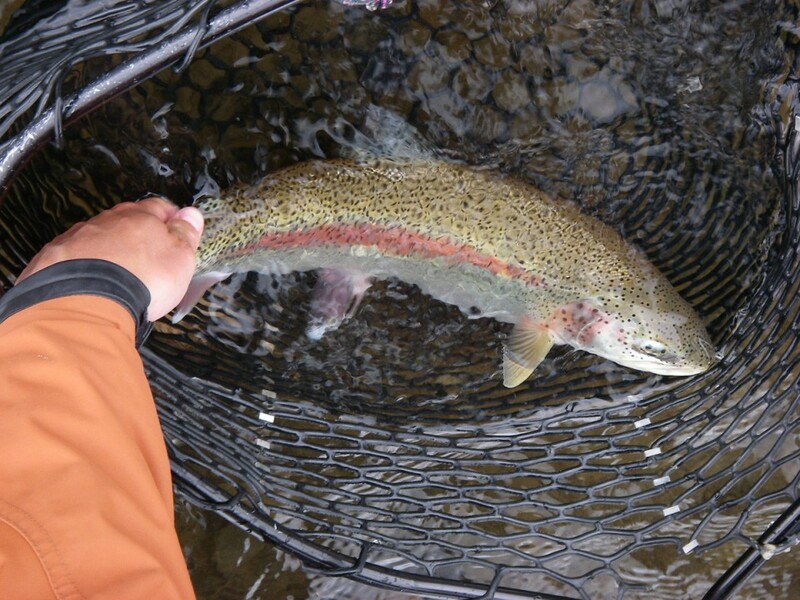 Several anglers had 20 plus Coho days in the lower river and over the course of the week took 4 of the 5 Pacific Salmon species (except King), 3 species of Char (Arctic, Dolly, & lake trout), Rainbows, and Grayling. 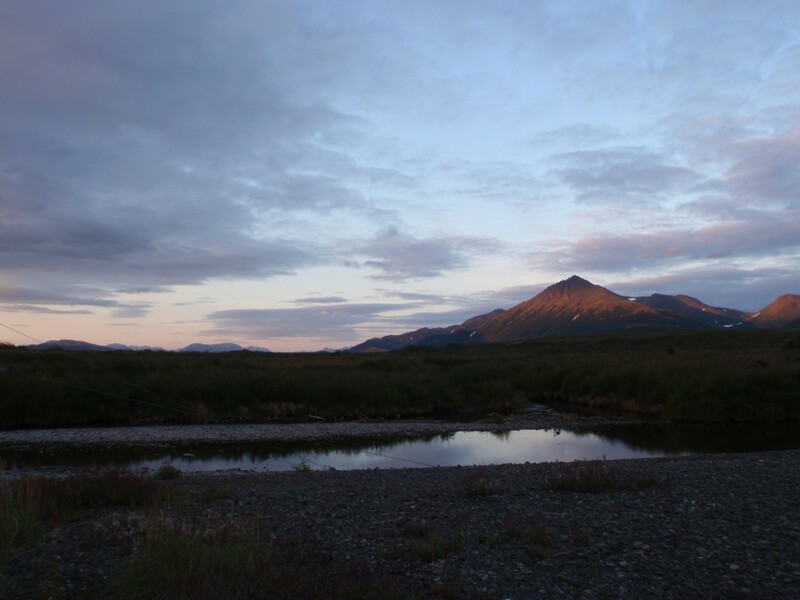 At the end of the day we camped at ‘porpoise flats’ and those who had the energy caught Silver Salmon until the tendons of their wrists and elbows and shoulders were so inflamed that casting became a burden. We’d come downriver under perfect conditions. The weather, the fish, the wildlife were perfect. To share such a fine experience with the friends, and the returning clients who’ve become friends, and my daughter, Anaca was spectacular. 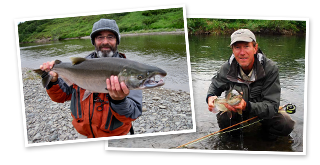 All of us are grateful to Olly Merril, Jim Bean, and Brian Malchoff the stellar fly-fishing guides whose enthusiasm and hard work made the week possible.